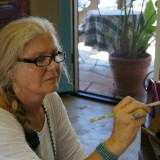 Holly organized the Santa Ynez Valley Artists’ Studio Tour for the Wildling Art Museum from 2006-2012. The event evolved into a full weekend with over 200 participants. Beginning with a Friday night reception for ticket holders and artists and continuing Saturday and Sunday when the individual studios opened. The tour involved around 20 artists who lived in the Santa Ynez Valley region. Scope of project: Meeting, interviewing, and selecting artists. Creation of artist agreement forms, project management, marketing, web content, brochures, tickets, postcards, sales, and oversight the weekend of the event. In 2011 Holly created original video to promote the event and expanded in 2012 to include 13 video interviews of participating artists.